The Samoyed is an average size dog that can live approximatively 14 years. It can weigh between 45 and 65 pounds (20 kg to 30 kg) and has an height of 19 to 23 inches (47 cm to 57 cm). 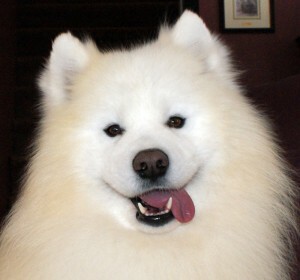 The Samoyed own a double coating fur that protect it from moisture and cold. It has semi-long and thick hair with natural oils that protect from dust. The Samoyed fur needs to be brushed weekly. It can take a bath but not too often if you don’t want to remove all his natural oils. 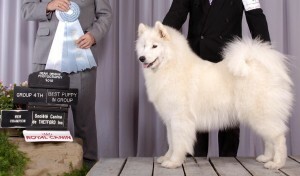 The colors of the Samoyed are usually pure white and cream with sometimes biscuit on different part of his body. The Samoyed seems to be heavier than it is. His agility is surprising. The Samoyed doesn’t need too much food to fill its energy needs. It is a Northern breed, class in the Working group (Group 3) by the CKC (Canadian Kennel Club). The Boxer, the Rottweiler, the Syberian Husky and the Newfoundland are the most popular race of this group.The Working dogs through the times has been used by humans for some tasks. By example : the Newfoundland would go in water without fear to rescue you, the Syberian Husky will tow your sleight at fast speed and the Rottweiler will not hesitate to protect you. The Samoyed is not an athlete of sleight like the Husky, but it can tow a sledge. The Samoyed is not a natural herding guardian like the Border Collie and it can be trained to do this work. The Samoyed is certainly a good family dog that will alert you from visitors entrance and will actively greeting everyone in a friendly way, specially the children. The Samoyed loves the children and will play carefully with them. But don’t ask it to defend you, it’s not an agressive dog. The Samoyed is one of the oldest bread in the world. It was raised by the tribe of Samoyeds in Siberia, in the North/West of Russia. The Samoyed was used depending of is shape for differents tasks : the bigger was going with humans to hunt. The night, they guard the herds of mooses which were used to trail luggages daily. They prevent masters from wolves coming. Sometime they could trail little luggages. The smallest and the puppies were staying with women and children at the camp and were used as dogs of company and guards. The women collected the hair to make hot clothing. The Samoyed was introduced with modern civilization at the beginning of the 19th century by Kilbur Scott, an English who contributed to popularize the race in Europe and America while establishing the standards which will be used as a basis for the various canine clubs. The Samoyed is not actualy popular like it was at the beginning of this century but it always counts undeniable followers who appreciate his friendship largely.